After Meghan Markle and Prince Harry get married, the happy couple will receive a written memento documenting Queen Elizabeth's approval of their union — and it's packed with beautiful details celebrating Harry and Meghan's heritage. With just a week to go until the pair walk down the aisle, Buckingham Palace on Saturday released the first images of the Instrument of Consent, a handwritten document that records the Queen’s consent, which she formally gave to the couple at the meeting of the Privy Council on March 14. As sixth in line to the throne, Harry must obtain formal permission from the monarch (a.k.a. his grandmother) to marry under the Succession to the Crown Act. Using the same language she used two months earlier, the Queen again referred to Harry in the formal document as her “dearly beloved” grandson. “NOW KNOW YE that We have consented and do by these Presents signify Our Consent to the contracting of Matrimony between Our Most Dearly Beloved Grandson Prince Henry Charles Albert David of Wales, K.C.V.O., and Rachel Meghan Markle,” the important document reads. Additionally, the Instrument of Consent features many sweet symbolic embellishments. On the left side of the text, there’s an elaborate design which joins together a red dragon — the heraldic symbol of Wales — with a rose, thistle and shamrock, which are the official floral emblems of the U.K. The design also features Prince Harry's label and includes three tiny red escallops from the Spencer family arms, representing his mother, the late Princess Diana. On the right side of the text, ther's a floral design directly referencing Meghan and Harry's union. The sweet image features a rose, which is the national flower of the U.S., flanked by two golden poppies, the state flower of Meghan's home state of California. Appearing between the two flowers, and directly under the rose, is the Welsh leek, which is paired together with Prince Harry's label. In one last touching detail, underneath the whole design are olive branches, which are featured in the Great Seal of the United States. Underneath the two main designs are two smaller images: on the left, the coronet for Prince Harry; on the right, the symbol for the Commonwealth. 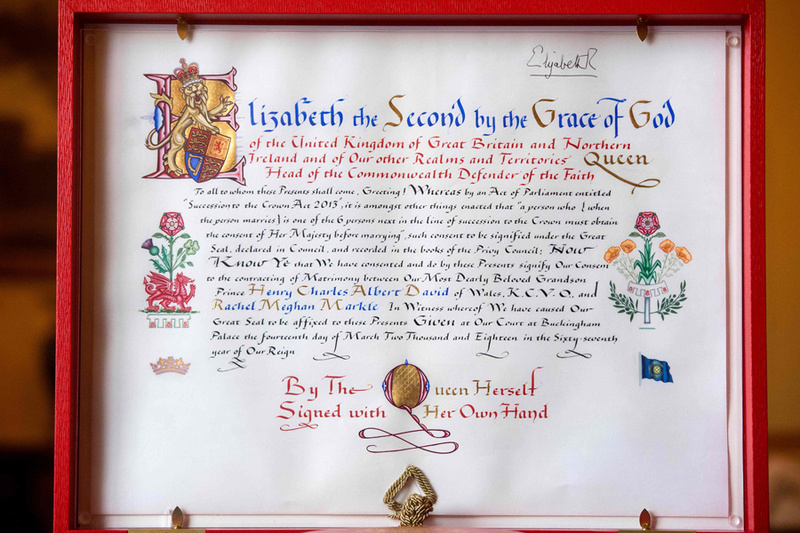 Lastly, the Instrument of Consent, which will be presented to the happy couple after their wedding on May 19, features the Queen’s signature towards the top right corner of the document and is sealed with the red Great Seal of the Realm.